This post originally appeared on a different website. While visiting Venice with Sherry Ott, we had the pleasure of getting a sneak peek at a new tour by Walks of Italy: VIP Access Secret Passages. Our tour guide, Giuseppina, met us at the base of one of the two columns in Piazzetta San Marco, the square between Palazzo Ducale (the Doge’s Palace) and the Campanile. We were immediately charmed by her relaxed, engaging demeanor, as well as a sense of humor that made itself apparent almost immediately. I’m sure it helped that we were all tingling with anticipation, since we were looking forward to seeing parts of the palace not normally seen by the public. On top of that, the tour itself is a newly created by Walks of Italy and had not yet officially launched. Secrets and a sneak peek – how thrilling! The Scala d’Oro is intricately crafted with gold leaf and tiny reliefs. 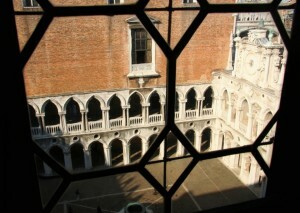 I had previously visited the Doge’s Palace as part of a package tour on my first trip to Venice several years ago. We had a guide, but she was nowhere near as knowledgeable and personable as Giuseppina. Additionally, we only visited the public parts of the Palace, which are richly decorated and designed to impress. The secret parts are quite a bit different! We saw many of the same public rooms as on my first trip, but with this tour we were also taken to the unvarnished, hidden parts of the palace, the parts where administrators worked behind the scenes, famous personages skulked past crowds safe from prying eyes, and where the condemned were first tried and later held. 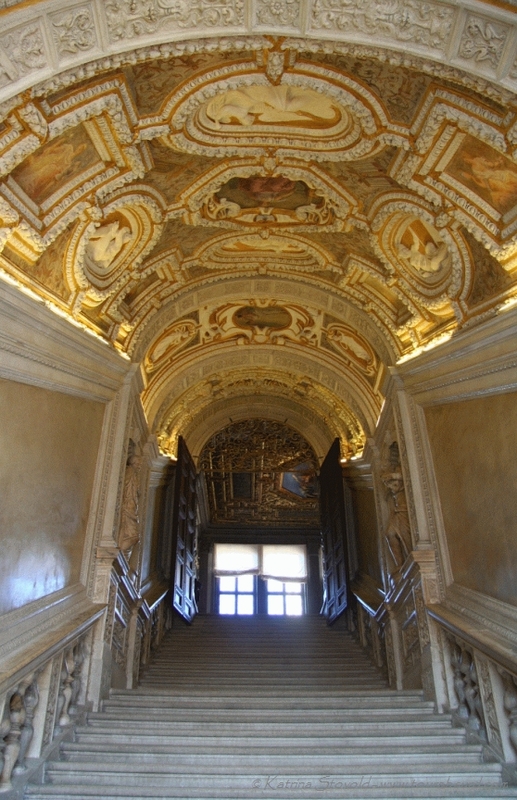 Photos of the interior are limited to areas just at the top of the Scala d’Oro (“golden staircase”), the Bridge of Sighs, and the new prison. We were able to get permission from the palace representative who accompanied us to take photos out some of the windows, however. View from the office of the Cancelliere. We learned that one could study Venetian politics for years and still find it a convoluted tangle. There was a senate, a small council, a big council, the Doge, the Consiglio, the Cancelliere (“Grand Counselor”), terms of office that lasted 3 months, lifetime appointments that might mean the lifetime in question was considerably shortened… And all in an attempt to avoid corruption and support the trade that made Venetians some of the wealthiest people on the planet. The non-public rooms are finished in an entirely different fashion than the public rooms. The walls and floor are plain wood, stained and sealed in most places, but minimally adorned. The furniture is well-crafted, but functional more than showy. There are two prisons within the palace and one, the “new” prison, next door across the Bridge of Sighs. Which prison someone was sent to depended on their status in society and the seriousness of the crimes for which they were convicted. Likelihood of survival was directly linked to which prison one was assigned. The worst one, the pozzi (“wells”) involved standing in knee-high water beneath the palace. Residents therein had a very short life expectancy indeed. 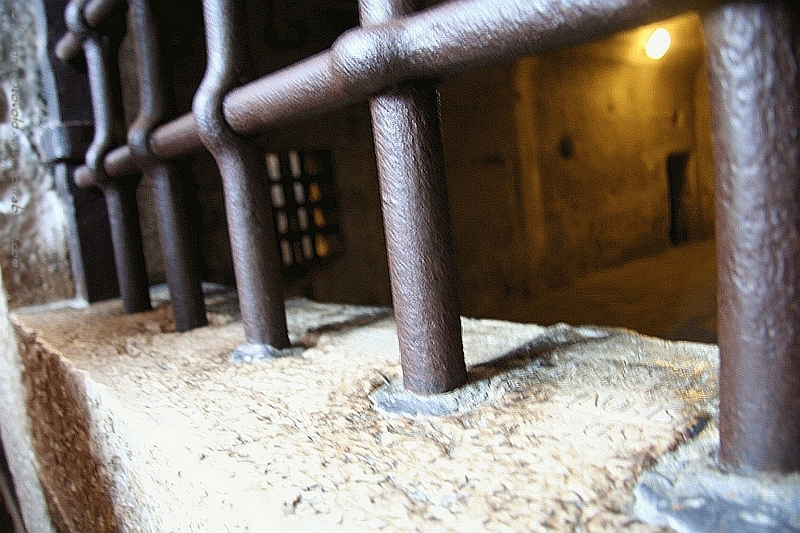 Bars in the “new” prison. Part two of the tour is St. Mark’s Cathedral. After emerging from what used to be the entrance of the palace, you find yourself next to the the cathedral. If you look closely, the marble facing, columns, and carvings are rather a mish-mash of styles, since they were not originally designed for St. Mark’s – they are war trophies from a raid on Constantinople. The story behind the raid is absolutely hilarious, but I don’t want to give it away – you must go to Venice and hear it from Giuseppina yourself! When standing in line, remember to look up. One tale I will tell you – at least what I remember – is that of Saint Mark. Around 828 A.D., the leaders (no rulers, just elected officials) of Venice, decided to retrieve the relics – by which I presume they mean remains – of Saint Mark from Alexandria, Egypt. They needed to smuggle the relics out of the city without arousing the suspicions of customs officials. 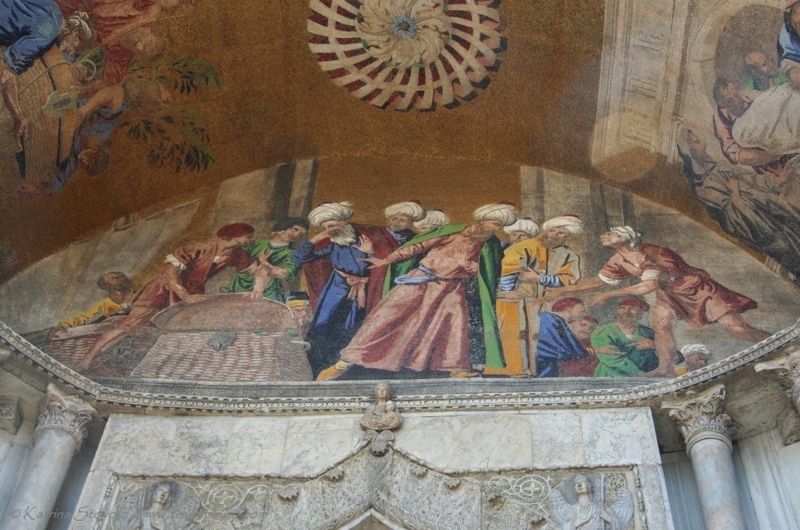 Since Egypt was already a Muslim country by that point, the Venetians, depicted in the mosaic above, lined the top of the basket with pork products. Seeing that pork was anathema to the customs officials, they did not delve any deeper. 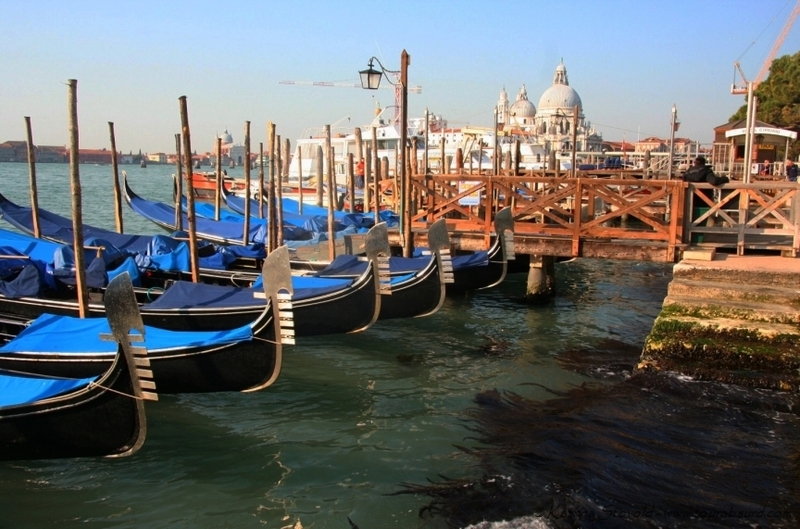 The relics were safely transported out of Egypt and brought to Venice, where they reside to this day. Inside the cathedral, photography is forbidden, as in most of the Doge’s Palace. The mosaics and gold leaf work are astonishing in their detail and beauty, so well worth a visit. The tour aims to get you there between 11:30 am and 12:30 pm, as that is the time of day when the mosaics are lit. 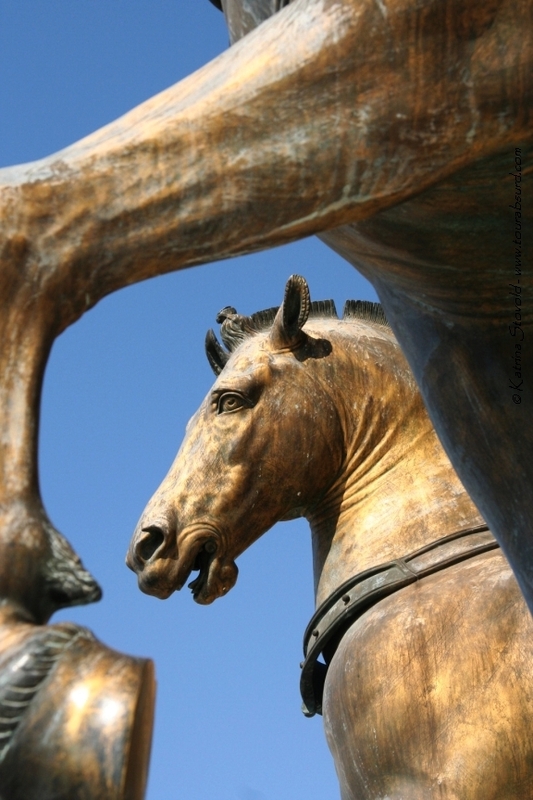 The original Greek Horses are housed inside the cathedral and are also lit at this time. Replicas of the horses decorate the exterior of the cathedral and can be seen just outside from where the originals are now safely preserved. 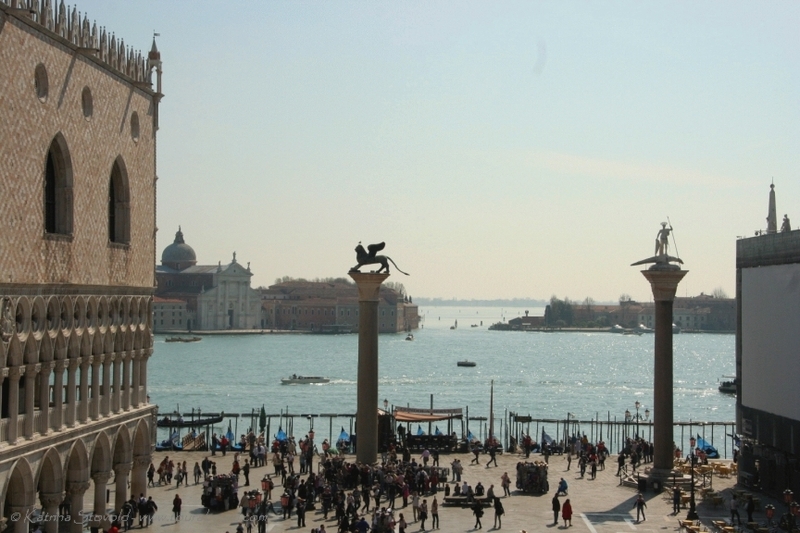 The view of Piazza San Marco and the main, seaward facing entrance to the city is fantastic. While you’re up there, notice the two columns, one topped with the winged lion representing Saint Mark / the city of Venice (another great story Giuseppina will tell you) and the other with Saint Theodore killing a dragon. You would be hard pressed to find a Venetian willing to walk between the two columns, as this was the place where criminals were traditionally hanged. A small marble head rests on the corner of the terrace from which you get this view. It is the spot where the heads of criminals were put on display as a warning to anyone who would dare interfere with the trade of the great city. I had to restrain myself from telling you too much of the history and amazing stories we learned on the tour. It was a tremendous amount, and all of it interesting. Although it’s certainly possible to do self-guided tours of both the Doge’s Palace and the cathedral, having a guide is so much more informative and rewarding. Indeed, two friends who were there recently were amazed to hear some of the stories I was able to relate – stealing St. Mark’s relics from Alexandria, the Doge’s torture room, the fates of those who were hung between the columns – and vowed to go with a guide next time because they’d missed so much. The tour is probably not a good match for those with mobility issues or small children, as there are many steps to climb. It is recommended for those with an interest in history, politics, art, and architecture. Bring a notepad or a voice recorder – there is so much to learn that you won’t want to miss! For information and reservations, please visit the Walks of Italy website.